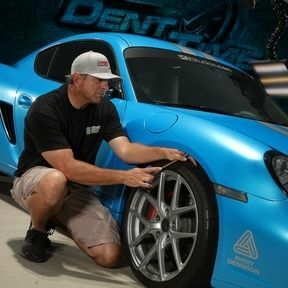 "Professional paintless dent removal tools and videos." Myke's PDR tutorials were some of the best videos I have seen. Well put together and easy to understand. A great way to get know the basics of dent removal. 1991, Myke's step-dad introduced him to PDR. As Myke slowly became better, he kept at it. With no internet, forums or other PDR techs to compare, Myke pushed himself to get better at paintless dent removal. In 2001, Dent Time was created after Myke and his step father parted ways. His mother once told him when she was alive, "you must learn how to become a good follower before you can become a good leader." In 2001 Dent Time was founded. With a combination of hard work, effort and determination anything can be achieved. As time went on, Myke opened up his forst commerce in 2006 selling other high PDR tools and products. Now offering his own professional produced pdr training videos. As time went on, Myke could tell PDR was much more than just a job. It was an ART!